Amnesty International has released a new report on the crackdown on the Rohingya people in Myanmar: as the months keep passing by, the minority is still exposed to violence. Relying on interviews with more than 120 Rohingya people, the watchdog said that "hundreds of thousands of women, men, and children have been the victims of a widespread and systematic attack, amounting to crimes against humanity." Additionally, the My World is Finished report included interviews with an array of medics, aid workers and journalists as well as satellite images and video captured on the spot. Rohingya Muslims, who crossed over from Myanmar into Bangladesh, wait during distribution of food items near Kutupalong refugee camp, Bangladesh, Tuesday, Sept. 19, 2017. The Guardian quoted Tirana Hassan, Crisis Response Director at Amnesty, as saying that "Myanmar's security forces have brutally meted out revenge on the entire Rohingya population of northern Rakhine State, in an apparent attempt to permanently drive them out of the country." Hassan referred to the Rohingya deadlock as "the region's worst refugee crisis in decades," which she said is being fueled by Myanmar's security forces' clampdown. In particular, eyewitnesses pointed the finger at "specific units, including the Myanmar Army's Western Command, the 33rd Light Infantry Division, and the Border Guard Police," according to the report. — AmnestyInternational (@amnesty) 18 октября 2017 г.
Myanmar refuses to recognize the Rohingya Muslims as citizens, largely perceiving them as illegal immigrants from Muslim Bangladesh. The Rohingya crisis, which actually originated in a conflict dating back to the 19th century, intensified on August 25, 2017, when Muslim insurgents of Rohingya origin attacked security posts in Myanmar's Rakhine State. 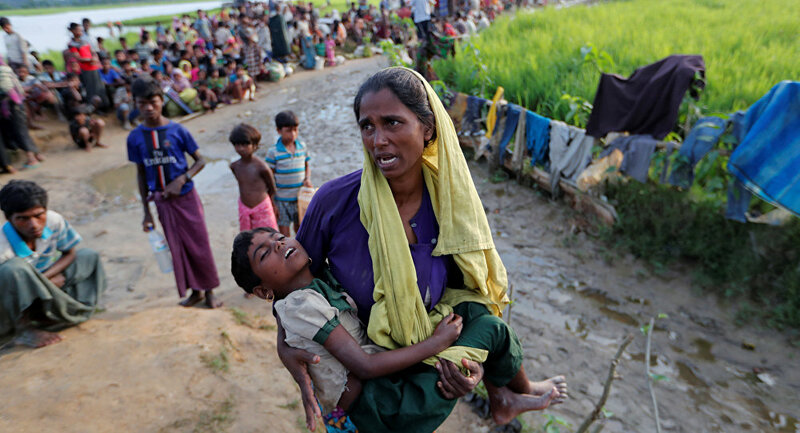 The Myanmar army's subsequent brutal crackdown led to a spate of clashes and the death of hundreds of Rohingya people. More than half a million Rohingya Muslims have already fled Myanmar, crossing into neighboring Bangladesh.